I’ve given much thought to this review over the past few days and still don’t know how to begin. There are so many things I liked about this fantasy novel. Ms. Mitchell’s storytelling ability captured my attention with the first sentence. I really liked how the story unfolded from the alternating perspectives of a brother and sister and how her writing style created the perfect mood for reading fantasy. There was also just enough intrigue to keep me wanting more. The ending was definitely too soon for me, but it was a clever cliffhanger of an ending and I will be watching for the next installment. Unfortunately, here comes the hard part. The grammar was terrible. I can overlook a sprinkling of misspelled words and punctuation errors, but this book didn’t appear to have been proofread at all. When reading fantasy, I expect to stretch my imagination to grasp the ideas and concepts being written and depend on quality editing that doesn’t distract from the flow and meaning of the words written. 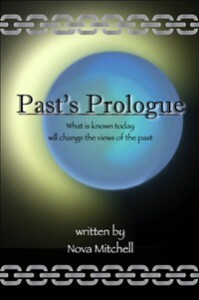 That was the biggest challenge for me with Past’s Prologue. The consistent use of misspelled words, missing words, punctuation errors, fragmented sentences, etc. were so distracting, I would have given up on the book altogether had the story been any less compelling. If this had been an audiobook with a decent narrator, my rating would be much higher. Overall, I would say the story was excellent and would recommend to anyone not easily distracted by grammatical errors. If this book fell into the hands of a good editor and was republished under a more fitting name, I wouldn’t be surprised to see it on the shortlist for YA fantasy awards.